The first time I envied someone’s Bible, it was a good thing. I was still new to the high school youth group, still carrying the pristine white King James leather-bound children’s Bible my great-grandmother had given me for my fifth birthday. His was a Student Bible, with the cover all scratched and beat up, and the corners of the pages curled – because he took it with him everywhere, and not just to church on Sundays. When he flipped through it, I could see all the verses were underlined and highlighted, with notes scribbled in the margins – because he really read it and studied it on his own. I didn’t know anyone under 40 did that. Though I honestly can’t remember a time when I didn’t know Jesus, seeing that messy Bible was a huge part of my spiritual awakening as a teenager. I was just beginning to realize that it was time for me to take ownership of my faith, my personal relationship with God. It stirred up within me a hunger for Him and His Word. It wasn’t long before I’d saved up my babysitting money to purchase a Student Bible of my own – and pretty soon, my Bible was a mess, too. A cherished and much-beloved mess. As the years went by, it literally fell apart, and I transitioned to other Bibles – other devotional and study Bibles, other translations. And frankly, prettier colors and cover designs. Lately I realized I’ve been feeling a lot of “Bible envy” again. But this time it hasn’t been such a good thing for me. I look at the pictures of heavily-underlined Bibles that other women post on their blogs, or the comments they make about how lost they’d be without their Bibles, or what a sacrifice it would be to give up their Bibles, or hear them describe how they’re carefully marking up their Bibles to pass on to their children or grandchildren. And I feel guilty and ashamed. Because not since that very first Bible I made my own, have I been able to settle on one in particular that is my “go-to.” I don’t have one Bible (and only one) that is dog-eared and highlighted and underlined and scribbled in, all the way through. 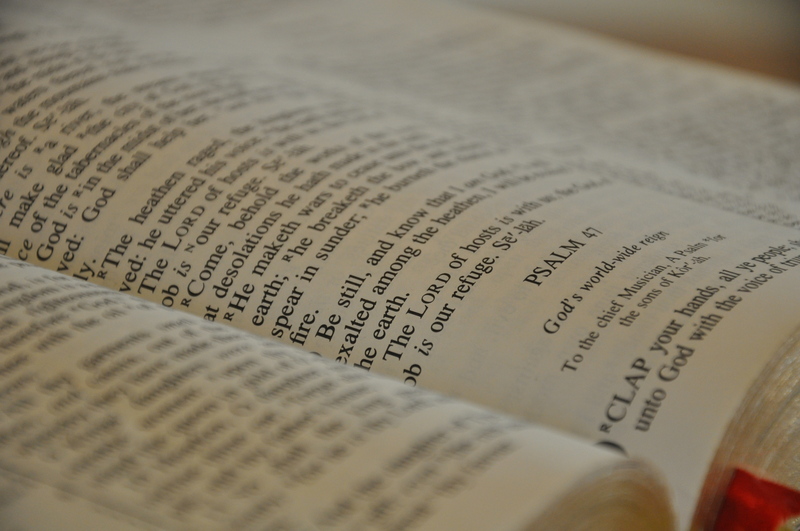 I have a bunch of Bibles on my shelf that I refer to regularly, plus my Bible software – but I don’t have one Bible I would have to grab if my house was on fire. It seems sacrilegious to even think this, let alone say it out loud, but I could get another one at the Christian bookstore tomorrow and be just fine. When I compare myself to these other women, I feel like such a failure. I feel like I’ve lost something or I’m missing out on something. Or I’m doing something wrong. And I feel like it makes me less of a Christian. That if anyone knew this about me, they’d be horrified. Or at least question whether I could really have much of a devotional life. For the first time this week (I know, I know), it occurred to me to challenge my thinking on this, to ask myself why I ever stopped underlining and highlighting and writing notes in my Bible. The answer is actually pretty easy: Because somewhere along the way, I discovered I like to copy meaningful verses in my journal. It helps me remember them. And there’s more space there for me to add my thoughts and prayers and reflections. Sometimes I like to look up multiple translations and copy them, too, and take notes from Bible commentaries. I even have room to add illustrations – my own drawings or images I’ve found online – whatever helps me visualize the application of a particular principle. And I can also attach words of wisdom and encouragement I’ve received in emails or cards from family and friends. So, honestly, my journals are what I would grab first if my house was on fire – because they hold all the Scriptures I’ve been studying, the truths God has been speaking to me. That’s where I keep them. about breaking free from guilt, discouragement, and defeat – letting go of the things that keep us from growing joyfully in spiritual maturity. Big stuff and small stuff. Everything from shame over the sins of our past to bitterness and unforgiveness to unhealthy comparisons, impossible standards and unrealistic expectations. Like imagining that our relationship with God should look like anyone else’s. Or even like it used to look for us, years and years ago. Or measuring the quality of our devotional life or the sincerity of our love for Jesus by the number of verses we have underlined in our Bibles. It’s a little thing, but envying the beautiful and meaningful way another woman chooses to remember how God speaks to her robs me of the joy of the beautiful and meaningful way I choose to remember how He speaks to me. So today I’m letting it go – I’m not going to carry that guilt and condemnation anymore. 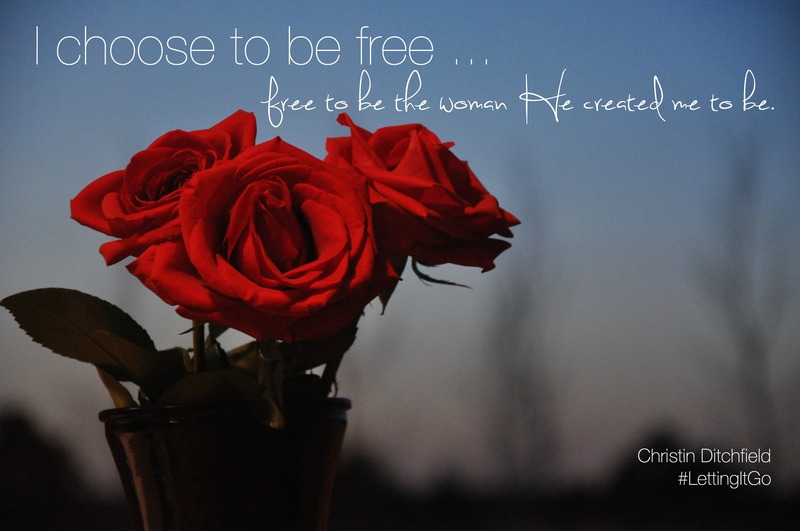 Because I choose to be free, free to be the woman He created me to be. 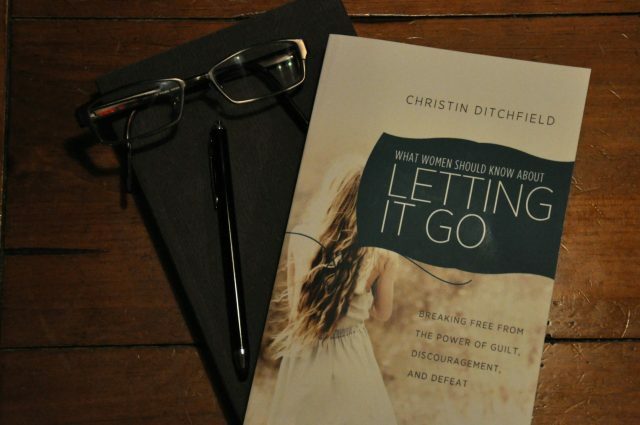 Christin Ditchfield is an author, conference speaker, and internationally syndicated radio host passionate about calling women to a deeper life. 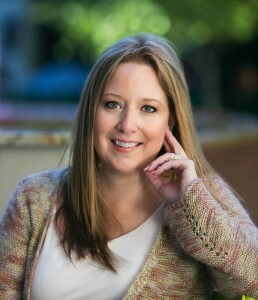 As a freelance writer, she has written hundreds of essays, columns, and magazine articles, and more than 66 books, including What Women Should Know About Letting It Go: Breaking Free from the Power of Guilt, Discouragement, and Defeat. She blogs at ChristinDitchfield.com. Buy What Women Should Know About Letting It Go by clicking here. We are giving away TWO COPIES of What Women Should Know About Letting it Go. There are many ways to enter. Fill out the Rafflecopter below and/or leave us a comment, telling us that you’d like to be entered in this giveaway. Thanks for your kind words, Mary T. And you’re entered in the giveaway. I wish I had copies for all of you. It’s a great read. Christn, I’m so happy that I read this today. I’m leading a mini-workshop for our women (for the first time-ack!) about the importance of making the Word their own through journaling. This piece has given me some great food for thought. So well said. Thank you! Thanks, Jody… so glad to help! 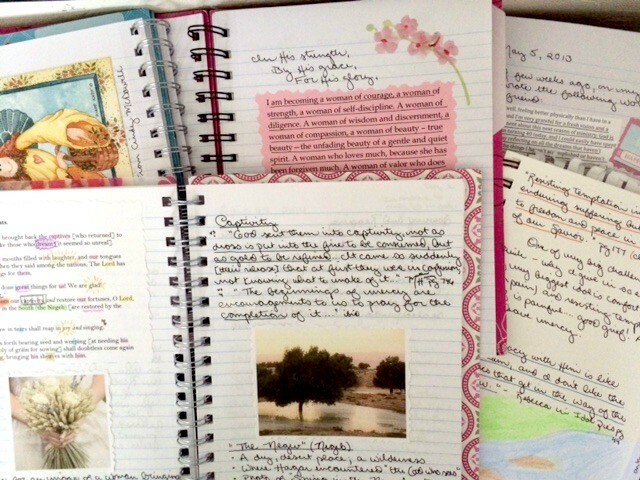 I know some women are really intimidated by the thought of journaling — and it may not be for everyone — but the older I get, the more I find joy in exploring new ways to connect with God! 🙂 Will be praying for your workshop! You would love it, Cheryl! Great for personal reflection, or group study. Christin, I enjoyed your post. I’m a journal girl too, but I decided not to feel like less of a Christian because my journals aren’t as pretty as yours. (Just kidding, but they really aren’t!) But I do appreciate your speaking up on such an important issue: we compare ourselves and fall up short in so many areas. May the Lord bless and use your book to encourage many! I know, right? Oh Betsy. I had to laugh when I read this. As I was uploading Christin’s post and that journal photo, I felt a twinge of jealousy. 🙂 My journals are a DISASTER in terms of presentation, but I do still treasure them. Thanks for being here! Thank you, Betsy! I have a Pinterest board full of the work of what I consider to be “real” art journal-ers, and I can only dream LOL… then again, I wish I had Jennifer’s gift for photography :)The thing is, if it inspires us — great! If it discourages us, that’s when we know we’re comparing and competing… and that’s what we’ve got to let go! Blessings to you! Ooooohhh, your journals are soooo gorgeous, Christin. I think I’m envious! Little joke, truly, but envy isn’t. Ask me how I know!! I’m a slow learner, but I am surely trying to let go the green-eyed monster. It eats our insides, causes us not to use our own gifts because we think they will never measure up, causes us to withhold praise from others, and even denies God, because we are either not using our gifts or are ungrateful for them. This is serious stuff. I love what you are showing here….not just that comparison is an unworthy endeavor, but that it’s important to operate in our giftedness or preferences–just the way that God uniquely made us. If you feel closer to God when you journal, then you are already doing what is important in developing intimacy in your relationship with Him. I, too, journal (and sometimes incorporate colorful art cards, photos, or even my fairly primitive drawings. I have found over the years that I love color and it attracts me to whatever I am doing, making it a more joyful experience.) I also scribble up my bibles. But the point is that I am doing what draws me closer to the Lord (and not trying to emulate what others do). This is a wonderful post, and your book is excellent. I’m about 3/4 of the way through. But don’t hold it against me if I don’t let it go. I know I will reread it someday. LOL! Lynn? I thought the SAME. THING. I became totally envious of her journals! 🙂 Thanks for the tip about acid-free journals. Hadn’t considered that. Oh yes, Jennifer. Acid-free is a big deal, believe me. Pls. tell Lydia too. I’m bugging her about journaling–good naturedly (a word?!) of course! Christin, thank you for this post! Timely, timely! I love how the God works that way. I would love to enter this giveaway. I love the message of letting go and not being a slave to expectations of ourselves or others. And am inspired by the images of your journals! Beautiful, creative, powerful! Thank you for sharing! Aren’t those journals so beautiful? Jennifer. ..thank you for your writing/blog. I love what you say about our “preapproved” ness! Sending you a strong (virtual) hug. . .love your heart! would love to learn to let go and quit beating my self up. I always know what to say to everyone but ME! Praying that you’re able to let go for good, cah. Thanks for being here. I know what you mean… a few years ago, someone pointed out to me that David models positive self-talk for us in the Psalms (Bless the Lord, O my soul / Be at rest, O my soul, for the Lord has been good to you) It’s a place to start, when you can’t find words of your own… praying for you today! Sure wish I could learn to let it go. The biggest battles I have are in my mind. I love my journals. This post made me want to find them all over the house and make sure they are in one place in case the house does catch fire! Of course I’ll have arms full of boys and dogs so they may just have to be left. Thanks for sharing Christin! How awesomely defeated the enemy would be if we never compared ourselves to others! How long have you been journaling, Paige? I go in streaks. I have a lot of different journals … prayer, Scripture, drawing, blog ideas, book ideas, lists of gratitude. How about you? Tell me more! I am very weird and quirky about my journals They are all around 6X9 size and MUST have spiral spine so they lay flat. College ruled only folks! I’ve journaled since I was little. Most consistent in the last few years. I do a lot of talking to God in them, scripture verses, “blog posts” that don’t make it on a blog, etc. I fancy myself a writer although I haven’t been published anywhere, but I will always write regardless. Even just for me and getting my 100 mph brain into some complete thoughts. Now that I think about it, I guess I have some kind of journal with me all the time. And I almost never go back and read old ones. I guess because I work a lot of raw stuff out and them and don’t wish to revisit. Maybe one day. Thanks for the giveaway. 🙂 Would love to win this book. Awesome. You’re entered in the giveaway! Thanks Jamie. I would love to have this important book! Christin, this strikes at the heart of something so common, and we all think or maybe hope, that no one will ever know we think this way… silly, because God knows, but I can tell you all the times I’ve done something like this already this week, lol… thanks for letting Him use you to inspire! And can I just say, Jennifer, your ministry, your blog, it’s all been such a revelation to me… so grateful for God’s ministry through you. Pivotal lately! Blessings and thanks. Thanks, Christine… Jennifer knows I wasn’t even sure if I should share it, because it does seem silly, BUT it’s one of those things that can really get in the way of those meaningful moments with God. So glad it encouraged you today! It IS a little thing. But then it morphs into something bigger. Christine, you’ve been very transparent in this post. It’s good to see, because those of us that are similar sometimes need the assurance that it’s not just us…and that God has more. Best wishes on your book release. I’d love to read a copy. Hey Kristi … Thanks for sharing. I agree with what you say, about small things morphing. So true. Absolutely… thank you, Kristi. I say it often, but it’s true — I’m so glad that none of us has to walk this journey alone — we can support and encourage each other. Blessings to you! YES! Thank you! Thank you! Beautiful words to ponder today. There is lays something that I need to let go in order to quit the comparison game. Your book, Christin, sounds just perfect. Thank you for this post and the giveaway. I also shared the giveaway on Facebook! Thanks! Thanks for sharing, Mary. Christin’s book is great for personal reflection, or group study. Lots of good questions after each chapter! I have this book on my CBD “wishlist”! Can’t wait to get it!! I have to get this book. Ah, Christin–I moonlighted in a Christian bookstore for five years, and you wouldn’t believe my collection of Bibles ;). I admire your journals–they’re beautiful. I have a NIV Bible that has text on one side and a blank page on the other–but I have my journals, too–so I’d pretty much need a box for everything I cherish if a fire were to break out! But that’s all immaterial–what’s important is that we’re all free to use our talents and learning styles to love God and worship him without envy of anyone else’s talent and learning style! Love this post Christin! Interesting timing as just in the last few weeks I’ve found myself desiring to go back to my Bible and write in it. My YouVersion digital Bible has lots and lots of highlights, but not the one I can flip pages in. 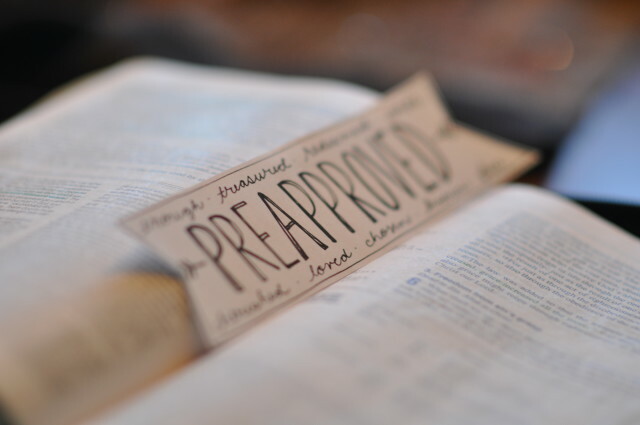 Regardless of if I do or don’t, I’m so thankful for that #preapproved grace. Bless you, friend. Oh this sounds like such a great book!! I’m sharing this post!! That’s a huge part of it right there, Rachel — not just what we let go of, but what we hold on to! This sounds like a great read for women of all seasons of life. I am always looking for more books for mentoring women. Whether I win or not – which of course I plan to do! – I will be reading this book! Thank you for sponsoring this Giveaway. No matter what happens :), I would love to read this book. It sounds wonderful! Oops! So glad you have an “edit” button! I did share on FB because I wouldn’t want anyone to miss out! I would love to read this book, sounds great! Comparison is so destructive to our hearts and it pushes us right into our flesh, which is never a great place to hang out. You’re book looks really good! Second post I have read in the last 15 minutes on this very topic. (Jesus, are you trying to speak to me?) I totally understand the battle of comparison and letting it go— Because God’s opinion is what matters! Best of luck with your book journey, Christin… and thanks for hosting, Jennifer! What a wonderful sounding book! I can think of several friends who would benefit from this as well! Wow, I love this so much. I don’t want to be robbed, due to insecurity and envy, from the relationship God wants to have with me. A daily battle, a constant surrender, for me for sure. Thank you, Christin and Jennifer. Understand this all too well. It is hard, but we are supposed to stay in our own lane, and run the race God designed for us. We are the only ones who can do this perfectly. Blessings. This really spoke to me. It is actually my story. I had a Bible that I interacted with, encircling, highlighting, underlining, drawing connections…back when I was first beginning a relationship with God for myself, instead of just knowing about Him – I still struggle with not feeling like I’m not enough, and I am so grateful that books are being written to help women win this battle. Thank you for writing this book…I’m sure it would be a rich blessing to read it. Thank you, Susan… do you still underline and highlight or do you journal now or do something totally different? I was giving myself a pep talk about defeat just yesterday and then I found this here on Jennifer’s site. I would love to read this book. I have my weeks…even months…of feeling like this “comparison” thing is under control. And then out of nowhere I’ve gone and done the 1) I’m not good enough(s) 2) My stuff isn’t as good at her stuff(s) 3) I thought I was doing it right but she does it better(s). Ok, does that make sense? 😉 Consider this my official “I’d love to win this book” comment. Wonderful post, Christin. Thank you, Jennifer — I think you’re so right! It’s an ongoing battle and it really catches us off guard sometimes… learning to see it for what it is — that’s a huge step forward. I would love to read Christin’s new book. I battle with comparison, embarrassingly every day. Thanks for the great post! Adding her book to my reading list! 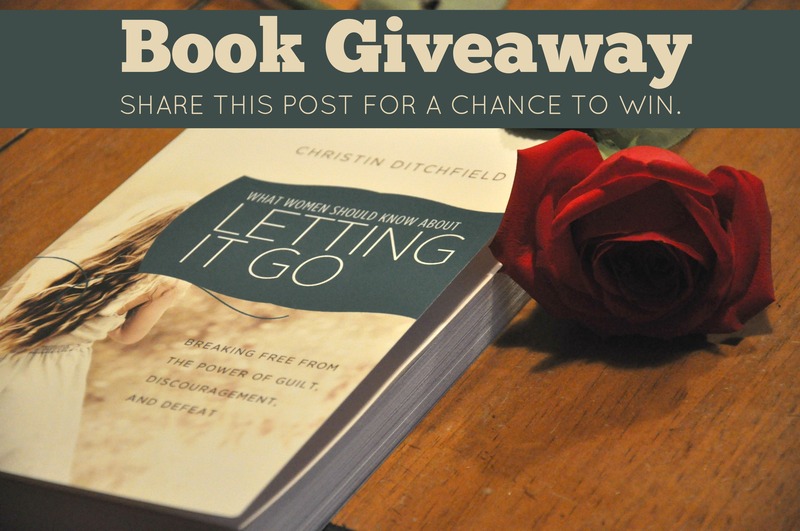 I think this book looks great and would love to win a copy! I remember having Bible envy quite a few times over the years. It’s a blessing to “come into your own” and accept yourself the way God does! Letting it go is something God has been dealing with me about recently. Thanks for the beautiful post and for hosting & God bless! This book sounds like it would be a blessing for exactly what I’m going through right now. There are so many things that I need to let go of, or they will pull me under. I would love to win a copy of this book. I also shared this giveaway on facebook. Thanks for the encouragement! Exciting give away! That looks like an absolutely must-read.